Resolution Funding is a leading settlement funding company. They offer lawsuit advances to clients who are waiting for their cases to work through the legal system, and are suffering financial burdens, often because they’ve been injured and are unable to work. 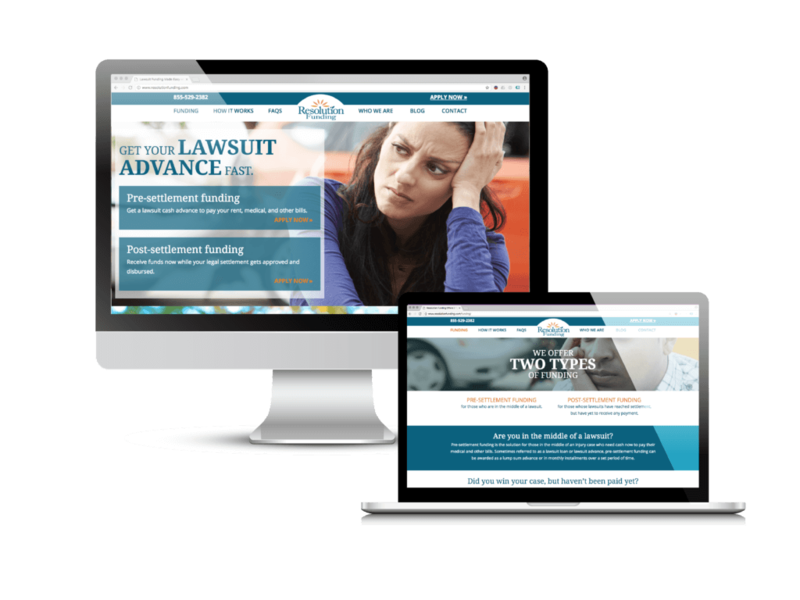 They needed a website that would help them target their clients, and easily explain to them how they could help them. They also wanted to create content that showed their expertise in the area, and could educate clients on the process and what they needed to look for. To update the website to help make the firm look larger than it really is. We created a very visual website with direct, simple content talking to their potential client, laying out exactly what they should expect. The website is easy to navigate, and clearly let the viewer know what to expect. We also work with them continuously on creating new content (and updating old content) on their blog, as well as managing their Google Adwords campaign and creating and editing custom landing pages to help capture new leads. Every month they have a continuous stream of new leads reaching out to them via the website. We’ve gone back and updated older blogs on the website in order to keep the content fresh, interesting and up-to-date for visitors, as well as continue to add new information about the industry.